My "ah-ha!!" moment ... awakening to practical karate. 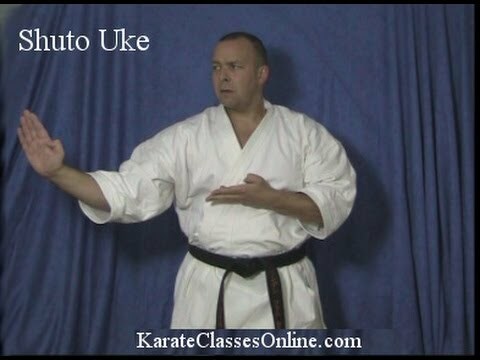 I think the first moment ... long ago, long before I knew the name "Abernethy" and so forth ... that started me down the karate path I'm on now ... the path that goes through this forum rather than "just punch, kick and block" post-war karate, was when I saw a certain photo regarding the shuto-uke. You know, "open-hand knife block", as people would explain and demonstrate it. ... then I saw this photo. I don't know who the two individuals are (sorry) but ... when I saw this photo a little light-bulb went on in my head and I thought "yeah!! That makes a lot more sense." Did any of you have an "ah-hah!!" moment? Care to share? I think my very first "Aha" moment came when I was learning Heian Sandan. In the Shotokan version (and perhaps in other styles too?) there is a sequence where you do a sort of crescent kick and then land into an "elbow block." You follow up with a back fist and then repeat the sequence twice. The movement was so bizarre and strange-looking that it forced me to step back and start wondering if there was some kind of "secret" to the kata. Unfortunately, I can't really say that it was a true "Aha!" moment, because even though I had a suspicion that there was more to the kata, I couldn't put the pieces together. The crescent kick kept throwing me off. I couldn't see how any of the motions worked together. About a year later, I ran across Iain's article on the "cross-buttocks throw" and everything started to make more sense. I probably had an "ah-ha" journey. I started in a weird style of TKD that, unlike the standard Shotokan or Shorin style base, originally had a Goju Ryu base and then became part of the standardization movement. Anyway, my instructor taught a wrist grab releases for a downward block akin to what's seen here at about 1:15. We had something similar for an outward block with reverse punch combination which included a lapel grab before the punch. I'm not sure if it was cross-training, eventually being on my own- instructor passed after three years into training- or what, but I was willing to look for movements outside the striking and blocking in ineffectual ways. I saw possible Judo throws in the backfist/sidekick combination akin (again) to Heian Nidan/Pinan Shodan. Eventually, American Kenpo came on my radar and that helped a lot. It's a newer system, so they actually have a form that has the majority of the self-defense counters that they practice. They don't really learn the form until after they have been practicing the technique against a partner. 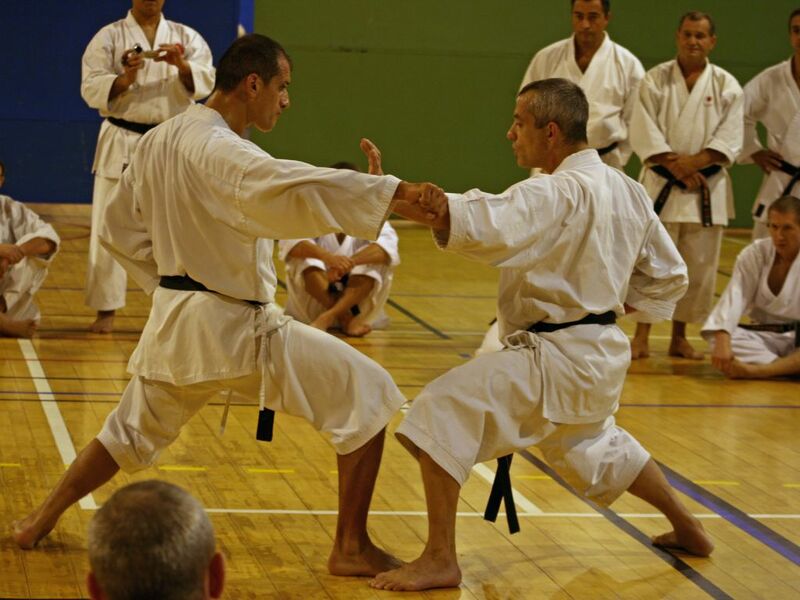 Here you can see something similar to Iain's rising block bunkai for a lapel release here. Finding Iain's forum 11 years ago or so was like finding out that I was not crazy and there was more out there. I don't think I had a single "Ah-ha" moment, what I did have was a real shift in focus as I approached my 1st Dan, in some ways I suppose at that time I thought well this is it, I'm going to be a black belt. I started looking a little deeper into the art that I was studying and what I was going to do once I got my black belt. A numebr of things happened around this time, and I couldn't be sure to get them all in the right order now. Some people in my club where cross training, some in Jui-Jitsu some in Aikido, someone leant me a copy of Iain's Karate's Grappling Methods, I got a copy of Patrick McCarthy's translation of the Bubishi. Not long after getting my 1st Dan I went to one of Iain seminar's and what struck me in addition to the hands on side was the knowledge that he was able to impart about karate. I carried on from there, my enlightenment I suppose was that there was far more to karate than my club, style, association, and more importantly and fundamentally that all karate is one. None of the stylistic distinctions that people make matter one iota should the situation arise in which you need to use your karate. I have experienced several epiphanies with respect to Kata. In no small measure related to Mr. Abernethy, but also Kris Wilder, Lawrence A Kane and Seikichi Toguchi. The most striking one though was the realisation that a closed fist can equally represent a grip, not just with hikite pulling hands, but also in "punches" and "blocks". I can't say that I had a single "ah-ha" or "Eureka" moment where everything suddenly clicked. For me, it was a very slow process of evolving understanding. In my original style, I eventually realized that I really enjoyed our self defense drills, but they didn't look anything like the kata I was told were the foundation of karate, and certainly didn't look like the bunkai I was taught. 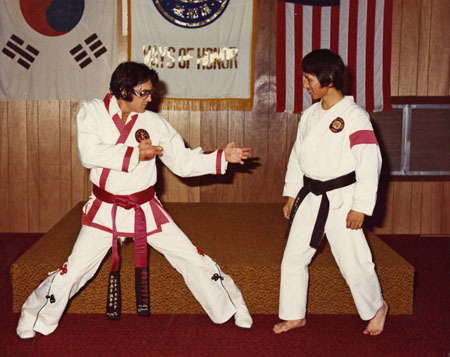 When I moved out of state, I had to train in karate on my own, which led to my doing a great deal of research. I started with Motobu, since he was considered part of the lineage of my old style, and that started to give me indications of what I should start looking for. From there, I found more references from the likes of Mabuni and Toguchi, and more modern work by Iain, Vince Morris, Kris Wilder, and Lawrence Kane. That allowed me to start seeing more in the movements of my kata, and I sought out an instructor who could help me explore those ideas. Luckily, I found one! I think over the course of my training I have had several moments where things just clicked. It was those times where you did or saw something and all of a sudden everything felt right. I think back and there are a few that really stuck with me. The one I'll share is probably one of them, where I got alot out of that short time period. Leon Jay, is the son of Wally Jay, the founder of Small Circle Jujitsu. We hosted a seminar at our school that had him and many other Small Circle Jujitsu instructors from around the world. At one point during the seminar we discussed the value of rotating your hips while doing a "soft" technique. At first I was a little confused on the purpose but he clarified how the two link together. He made the comment to go back and watch old VHS tapes of grandmasters doing bunkai. He said you will most likely noticed that all of their self defenses start soft/slow/flowy-like, and finish with a strong/hard hit. He said by utilizing the soft motion you can set yourself up to quickly rotate your hips as you deliver the last blow. This causes you to transfer every bit of kinetic energy your body can put out in a sinlge strike. He was amazing at dropping large men like they were nothing. It was at that point after watching him that so many of my techniques really came together. After the seminar I later got to do a little interview with him about his personal life, family, and background in martial arts. I'll post the link below in case you care to read it!